Minqi Li teaches economics at the University of Utah in Salt Lake City. Until recently, the global capitalist economy has enjoyed a period of comparative tranquility and grown at a relatively rapid pace since the global economic crisis of 2001–02. During this period of global economic expansion there have been several important economic and political developments. First, the United States—the declining hegemonic power but still the leading driving force of the global capitalist economy—has been characterized by growing internal and external financial imbalances. The U.S. economy has experienced a period of debt-financed, consumption-led “expansion” with stagnant wages and employment, and has been running large and rising current account deficits (the current account deficit is a broad measure of the trade deficit). Second, China has become a major player in the global capitalist economy and has been playing an increasingly important role in sustaining global economic growth. Third, global capitalist accumulation is imposing growing pressure on the world’s natural resources and environment. There is increasingly convincing evidence that the global oil production will reach its peak and start to decline in a few years. Fourth, the U.S. imperialist adventure in the Middle East has suffered devastating setbacks and there has been growing resistance to neoliberalism and U.S. imperialism throughout the world. As the U.S. housing bubble bursts and the dollar’s dominance over the global financial system becomes increasingly precarious, the U.S. economy is now going into recession and the global capitalist economy is entering into a new period of instability and stagnation. The coming years are likely to see a major realignment of the various global political and economic forces and will set the stage for a new upsurge of the global class struggle. Since the 1980s, neoliberalism has become the dominant economic ideology of global capitalism. Under the neoliberal policies and institutions (such as monetarism, privatization, deregulation, labor market “reform,” and trade and financial liberalization), inequalities in income and wealth distribution surged, and in many parts of the world, people suffered devastating declines in living standards. As financial capital flowed between countries in search of speculative gains, one national economy after another was destroyed. Under the pressure of financial capitalists and their institutional representatives (such as the International Monetary Fund, the World Bank, and the U.S. Treasury Department), many national governments were committed to so-called “responsible” fiscal and monetary policies, often leading to disastrous economic and social consequences. By the 1990s, the contradictions of neoliberalism led to increasingly more violent financial crises. 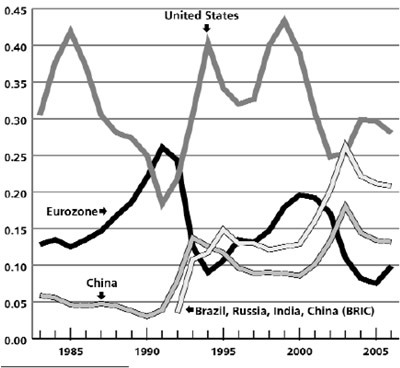 From 1995 to 2002, the global economy was struck successively by crises that developed in Mexico, countries in Southeast Asia, Russia, Argentina, and Turkey. The Japanese economy struggled with deflation and stagnation following the burst of the asset bubble in 1990. There was a serious danger that the entire global capitalist economy could fall into a vicious circle of financial breakdowns and sink into depression. In this context, the U.S. current account deficits played an indispensable stabilizing role. In the 1990s, the United States experienced the greatest stock market bubble in history. Despite stagnating real wages and family incomes, household consumption expanded rapidly as household debt surged. In the 2001 recession, fearing that the United States could fall into a persistent, Japanese-style stagnation, the Federal Reserve drastically cut the policy interest rate and kept the real policy interest rate at below zero for several years. As a result, the stock market remained highly overvalued by historical standards and the excessive supply of money and credit capital in turn fueled a major housing bubble. Fueled by one asset bubble after another, the U.S. economy has been able to maintain a relatively rapid expansion of domestic demand. As the rest of the world suffers from insufficient internal demand, U.S. imports of goods and services have tended to grow more rapidly than exports. As a result, the United States has been running large and rising current account deficits, which reached more than 800 billion dollars or 6 percent of GDP by 2006. The U.S. current account deficits directly generate effective demand for the rest of the world economy, allowing many economies, including the Asian economies and oil and commodities exporters, to pursue export-led economic growth. But perhaps more importantly, the U.S. current account deficits represent U.S. spending in excess of income that must be financed by borrowing from the rest of the world. The U.S. deficits thus create assets for the rest of the world. The central banks of the Asian economies and oil exporters have become the major financiers of the U.S. current account deficits. From 1996 to 2006, the total foreign exchange reserves of the low- and middle-income countries surged from 527 billion dollars to 2.7 trillion dollars and their share in the world GDP more than tripled from 1.7 percent to 5.6 percent. Rising foreign exchange reserves have reduced the risk of massive capital flight and financial crisis, allowing these countries to have some space to pursue expansionary macroeconomic policies. China, in particular, has played a crucial role in financing the U.S. current account deficits and has accumulated the world’s largest foreign exchange reserves currently standing at about 1.6 trillion dollars. Source: World Bank, World Development Indicators Online, http://devdata.worldbank.org/dataonline. Chart 1 presents the world economic growth rates from 1961 to 2006, with the world GDP measured in constant 2000 U.S. dollars. In the “golden age” of the 1960s, the global economy expanded rapidly with annual growth rates fluctuating between 4 and 7 percent. Since the 1970s, the global economy has been struggling with sluggish growth with growth rates mostly fluctuating between 2 and 4 percent. During four periods, 1974–75, 1980–82, 1991–93, and 2001–02, the global economy was in deep crisis (although there is no official definition, the global economy is generally considered to be in recession when world economic growth rate falls below 2.5 percent a year). Since 2003, the global economy has enjoyed some relative stability and has grown at about 4 percent a year. However, with the U.S. economy now going into recession, this short-lived relative stability is about to come to an end. Table 1 presents selected economic indicators of the U.S. economy. The U.S. economic recovery after the recession in 2001 was very weak. Since then, the average annual growth rate has been only 2.4 percent compared to 4 percent in the 1960s and 3.3 percent in the 1980s and 1990s. Both employment and workers’ real wages have been stagnant. Measured in 1982 dollars, the U.S. private sector workers’ average real hourly wage in 2006 was 8.2 dollars, about eighty cents lower than in 1972. Since 2000, real median family income has been falling. However, corporate profits have surged. Corporate profits as a share of GDP rose from 5.8 percent in 2001 to 9.8 percent in 2006. The stock price to earnings ratios remain excessively high, suggesting that the stock market bubble has not yet been fully deflated. The stock market boom in the late 1990s led to pervasive over-investment. 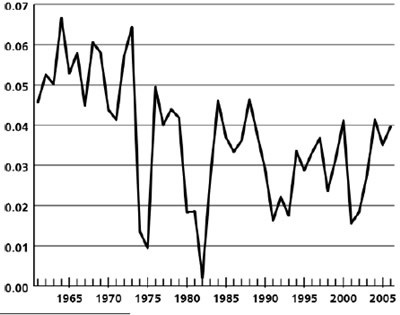 In the early 2000s, the industrial capacity utilization rates were at the lowest levels decade by decade in the post-Second World War period. With substantial excess production capacity, private investment has been sluggish despite the dramatic improvement in corporate profitability. U.S. economic growth since 2001 has been led by the expansion of household consumption, which now accounts for over 70 percent of GDP. As the majority of households suffer from falling or stagnant real incomes, the expansion of consumption has been financed by the explosive growth of household debt. U.S. household debt soared from about 90 percent of personal sector disposable income to 103 percent in 2000, and to 140 percent in 2006. By 2007, the household debt services (interest and principal payments on debt) had risen to 14 percent of disposable income, the highest on record. In the meantime, the household saving rate (the ratio of household saving relative to disposable income) has fallen from the historical average of near 10 percent to virtually zero now. Source: the U.S. Bureau of Economic Analysis, http://www.bea.gov; the U.S. Economic Report of the President, http://www.gpoaccess.gov/eop/tables07.html; the U.S. Federal Reserve Board, http://www.federalreserve.gov/releases. The debt-financed consumption was clearly unsustainable. Neither household debt nor the debt service burden can rise indefinitely relative to household income. With the burst of the housing bubble, households will have to increase their saving rates and reduce their debt burden. If the household saving rate were to return to its historical average level, it would lead to a huge reduction of household spending. With the majority of U.S. households suffering from falling or stagnating real incomes, it is difficult to see how consumption can grow rapidly in the coming years. If consumption stagnates, then given the overwhelming weight of consumption in the U.S. economy, it is highly likely that it will fall into a deep recession followed by persistent stagnation. Will the Federal Reserve be able to come to the rescue and create yet another massive asset bubble? Terrified by the turmoil of the global stock markets, the Federal Reserve has already cut interest rates drastically. However, with both the stock market and the housing market quite overvalued, one can hardly identify another major asset bubble to create. Moreover, with the household debt level so high and the household saving rate already so low, low interest rates can do very little to stimulate household consumption. More realistically, with household consumption stagnating or contracting, the U.S. government could attempt to make up the shortfall with more public spending and an increase in the fiscal deficit. If the household saving rate rises toward its historical average, then Washington will have to run a very large fiscal deficit, on the order of 6 percent of GDP or more. Given the current political environment in the United States, it is doubtful that an effective fiscal policy of a sufficiently large magnitude could be developed and implemented. If the current, or more likely, the next administration has the nerve to use very aggressive expansionary policies to jump-start the economy, then the United States is likely to continue running very large current account deficits. With a current account deficit of 6 percent of GDP, theoretically, the U.S. net foreign debt could keep rising up to 120 percent of GDP.1 This would clearly be impossible. Long before this theoretical limit is reached, it would become increasingly difficult for the United States to finance its current account deficits. The current relatively orderly decline of the dollar would then develop into a crash. The dollar would lose its status as the world’s main reserve currency and the United States would experience its own shock therapy. One way or the other, the United States will not be able to run large and rising current account deficits much longer. Given the crucial role of the U.S. current account deficits in stabilizing the global capitalist economy, if the U.S. economy falls into persistent stagnation and the U.S. current account deficit has to be corrected, the question arises: Which of the other large economies can replace the United States to lead the expansion of the global capitalist economy? Chart 2 compares the contribution to world economic growth by the world’s big economies (measured by the ratio of national economic growth to global economic growth). The U.S. contribution has fallen from about 40 percent in the late 1990s to approximately 30 percent today, and the Eurozone contribution has fallen from about 20 percent to about 10 percent. By comparison, China’s contribution has risen to about 15 percent and the “BRIC” group (Brazil, Russia, India, and China combined) now generates more than 20 percent of the world’s economic growth. Sources: World Bank, World Development Indicators Online, http://devdata.worldbank.org/dataonline. As the Eurozone lacks growth momentum and Brazil, Russia, and India remain relatively small to play decisive roles in the global economy, China seems to be the only plausible candidate to replace the United States to become the leading driving force of the global capitalist economy. Can China lead global capitalism into another period of stability and rapid growth? After Deng Xiaoping’s notorious “Southern Tour” in 1992, the Chinese Communist Party’s leadership was officially committed to the goal of a “socialist market economy,” which, in the Chinese context, is nothing but a euphemism for capitalism. In the 1990s, most of the state and collectively owned enterprises in China were privatized. Tens of millions of state and collective sector workers were laid off. The remaining state sector workers lost their traditional socialist rights symbolized by the “iron rice bowl” (a package of economic and social rights that included job security, medical care, child care, pensions, and subsidized housing) and were reduced to wage workers exploited by domestic and foreign capitalists. In the rural areas, with the dismantling of the people’s communes, public medical care and education systems have collapsed. More than a hundred million have become migrant workers, forming the world’s largest reserve army of cheap labor. Source: International Labour Office (Geneva), Yearbook of Labour Statistics 2006, 763–838, 933–1031. Wage rates are converted into U.S. dollars using exchange rates from World Bank, World Development Indicators Online (2007). 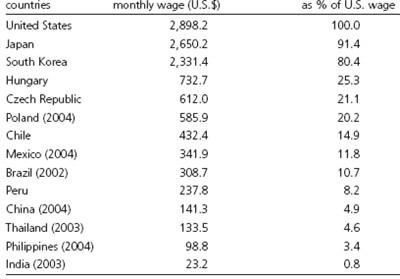 Table 2 compares the Chinese workers’ wage rate with the workers’ wage rates in selected countries. An average worker’s wage rate in China is about one-twentieth of that in the United States, one-sixteenth of that in South Korea, one-quarter of that in Eastern Europe, and one-half of that in Mexico or Brazil. The Chinese wage rate now seems to be higher than those in the neighboring Southeast Asian countries. But the Chinese wage rate could be overstated as the official wage statistics only cover the workers in the urban formal sector and do not include the migrant workers. A large, productive, and cheap labor force allows Chinese capitalists and foreign capitalists in China to profit from intense and massive exploitation. However, this raises the question how the massive amount of surplus value produced by the Chinese workers can be realized through “effective demand.” With the majority of the Chinese workers and peasants heavily exploited, mass consumption at best has been growing at a slower pace than the overall economy. As mass consumption lags behind, the Chinese economy has increasingly depended on investment and exports to lead the expansion of demand. 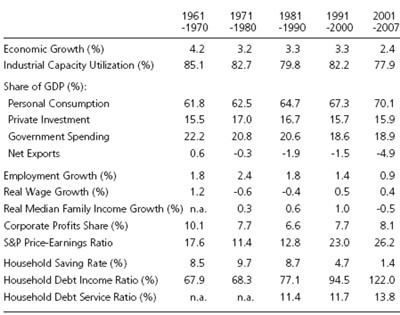 Table 3 presents selected indicators of the Chinese economy. Source: China’s National Bureau of Statistics, China Statistical Yearbook 2007 and earlier years. Labor income (the sum of the urban residents’ wage incomes and the peasants’ net incomes) as a share of China’s GDP fell from 51–52 percent in the 1980s to 38 percent in the early 2000s. Similarly, household consumption as a share of GDP fell from 50–52 percent in the 1980s to 41 percent in the early 2000s. By contrast, the share of investment in GDP rose above 40 percent and the share of exports rose above 30 percent. Net exports already made a significant contribution to China’s economic growth in the late 1990s and early 2000s. Since then, China’s trade surplus has experienced explosive growth. For 2007, China had an enormous current account surplus of $378 billion, or 12 percent of China’s GDP. In a few years, China is expected to overtake Germany to become the world’s largest exporter. How long can China’s current model of growth be sustained? The United States accounts for about 20 percent of China’s overall export market. In 2007, the European Union as a whole (including the Eurozone, the United Kingdom, and the new member states of Eastern Europe) actually replaced the United States to become China’s single largest export market. However, for China to run large current account surpluses, some other economies have to run large current account deficits. The European overall current account balance has been in rough balance. From a global perspective, China’s current account surpluses have been entirely absorbed by the U.S. current account deficits. If the United States no longer runs large current account deficits, then unless Europe starts to run large deficits, it will be very difficult for China to sustain its large trade surpluses. If the current level of investment is sustained for some more years, it would leave China with a massive amount of excess production capacity that is far greater than what is needed to meet the final demand in the world market and far greater than what can be supported by the world supply of energy and raw materials. China would then be threatened with a major economic crisis. For the Chinese economy to be restructured on a more “sustainable” basis (from the point of view of sustaining capitalist accumulation), the Chinese economy has to be reoriented toward domestic demand and consumption. As China’s investment and net exports have been rising more rapidly than the overall economy, the combined share of household and government consumption now stands at less than 50 percent of GDP. If investment were to return to more sustainable levels (about 30–35 percent of GDP) and the trade surplus were to become smaller (0–5 percent of GDP), then the combined share of household and government consumption would need to rise by more than 15 percentage points to 65 percent of GDP. But for consumption to rise, the workers’ and peasants’ incomes and government social spending have to rise accordingly. Table 3 shows the close correlation between labor income and household consumption. It follows that there must be a massive income redistribution from capitalist income to labor income and social spending by the amount of about 15 percent of GDP. Will the Chinese capitalist class be enlightened enough to undertake such an economic and social restructuring? Suppose the Chinese Communist Party’s leadership is sufficiently farsighted to understand that for the sake of the long-term interest of Chinese capitalism, it is necessary to make some concessions to the Chinese workers and peasants. Will the party have the necessary will and means to impose such a redistribution on the transnational corporations, on the wealthy Chinese capitalists (many of whom have intimate connections within the party and the government), and on the provincial and local governments that have in recent years developed various alliances with the domestic and foreign capitalists? These are some difficult questions for the Chinese capitalist elites. Suppose the Chinese capitalist class has the necessary wisdom and will to pursue a Keynesian, social-democratic-style restructuring. Will such a restructuring take Chinese capitalism onto a path of sustained stable and rapid growth, and will the expansion of the Chinese economy in turn lead the global capitalist economy into another “golden age”? 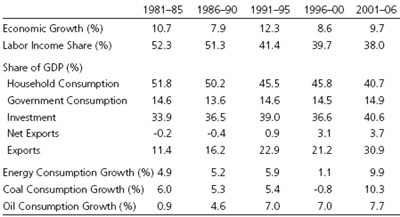 Table 3 shows the growth of China’s energy consumption. Since 2000, it has greatly accelerated. It now accounts for 15 percent of the world total and amounts to 70 percent of U.S. energy consumption. At the current growth rate, China’s energy consumption will double in seven years and China will soon overtake the United States to become the world’s largest energy consumer. China depends on coal for about 70 percent of its total energy consumption and China’s coal consumption is also growing at a rate indicating a doubling in seven years. China’s oil consumption (already accounting for one-third of the world’s incremental demand for oil) is growing at a rate that implies a doubling in nine years. In other words, in about a decade if the current trend holds up, China will consume one and a half times as much energy as the United States consumes today. Will the world energy supply keep pace with China’s rapidly growing demand while meeting the demand from the rest of the world? The global capitalist economy depends on fossil fuels (oil, natural gas, and coal) for 80 percent of the world’s energy supply. Oil accounts for one-third of the total energy supply and 90 percent of the energy used in the transportation sector. Oil is also an essential input for the production of fertilizers, plastics, modern medicine, and other chemicals. If world oil production and the production of other fossil fuels reach their peak and start to decline in the coming years, then the global capitalist economy will face an unprecedented crisis that it will find difficult to overcome. The rapid depletion of fossil fuels is only one among many serious environmental problems the world is confronting today. The capitalist economic system is based on production for profit and capital accumulation. In a global capitalist economy, the competition between individual capitalists, corporations, and capitalist states forces each of them constantly to pursue accumulation of capital on increasingly larger scales. Some argue that because of technological progress, the advanced capitalist countries have become “dematerialized” (decreasing the throughput of materials and energy per unit of output) as economic growth relies more upon services than traditional industrial sectors, thus making economic growth less detrimental to the environment. In fact, many of the modern services sectors (such as transportation and telecommunication) are highly energy and resource intensive. Moreover, part of what is referred to as dematerialization arises from the relocation of industrial capital from the advanced capitalist countries to the periphery in pursuit of cheap labor and low environmental standards. The dramatic rise of Chinese capitalism partly results from this global capital relocation. Although the advanced capitalist countries may have become slightly “dematerialized” in this sense, the capitalists and the so-called middle classes in China, India, Russia, and much of the periphery are emulating and reproducing the very wasteful capitalist “consumerist” life style on a massively enlarged scale. Global capitalism as a whole continues to move relentlessly toward global environmental catastrophe. On February 1, Immanuel Wallerstein, the leading world system theorist, in his biweekly commentaries pronounced the year 2008 to be the year of the “Demise of the Neoliberal Globalization.” Wallerstein begins by pointing out that throughout the history of the capitalist world-system, the ideas of free market capitalism with minimal government intervention and the ideas of state regulated capitalism with some social protection have been in fashion in alternating cycles. In response to the worldwide profit stagnation in the 1970s, neoliberalism became politically dominant in the advanced capitalist countries, in the periphery, and eventually in the former socialist bloc. However, neoliberalism failed to deliver its promise of economic growth, and as the global inequalities surged, much of the world population suffered from declines in real incomes. After the mid-1990s, neoliberalism met with growing resistance throughout the world and many governments have been under pressure to restore some state regulation and social protection. Confronted with economic crisis, the Bush administration has simultaneously pursued a further widening of inequality at home and unilateral imperialism abroad. These policies have by now failed decisively. As the United States can no longer finance its economy and imperialist adventure with increasingly larger foreign debt, the U.S. dollar, Wallerstein believes, faces the prospect of a free fall and will cease to be the world’s reserve currency. Following Wallerstein’s arguments, in the coming years we are likely to witness a major realignment of global political and economic forces. There will be an upsurge in the global class struggle over the direction of the global social transformation. If we are in one of the normal cycles of the capitalist world-system, then toward the end of the current period of instability and crisis, we probably will observe a return to the dominance of Keynesian or state capitalist policies and institutions throughout the world. However, too much damage has been done. After centuries of global capitalist accumulation, the global environment is on the verge of collapse and there is no more ecological space for another major expansion of global capitalism. The choice is stark—either humanity will permit capitalism to destroy the environment and therefore the material basis of human civilization, or it will destroy capitalism first. The struggle for ecological sustainability must join forces with the struggles of the oppressed and exploited to rebuild the global economy on the basis of production for human needs in accordance with democratic and socialist principles. In this sense, we have entered into a new age of transition. Toward the end of this transition, one way or the other we will be in a fundamentally different world and it is up to us to decide what kind of world it turns out to be. 1. The net foreign debt equals the cumulative sum of the current accounts deficits. If we assume that the U.S. current account deficit remains at 6 percent of GDP, the U.S. nominal GDP growth rate continues at 5 percent a year, and there is no change in the exchange rate, then theoretically the U.S. net foreign debt to GDP ratio will keep rising up to 120 percent. 2. Martin Wolf, “China Changes the Whole World,” Financial Times, January 23, 2008. 3. The Germany Energy Watch Group, “Crude Oil—The Supply Outlook,” EWG-Series no. 3 (October 2007), http://www.energywatchgroup.org. 4. The Association for the Study of Peak Oil and Gas, Newsletter No. 86 (February 2008); The Germany Energy Watch Group, “Coal: Resources and Future Production,” EWG-Series No. 1 (March 2007), http://www.energywatchgroup.org. 5. Ted Trainer, Renewable Energy Cannot Sustain A Consumer Society (Dordrecht, Netherlands: Springer, 2007), 73–92. 6. On the potential destructiveness of capitalist accumulation on the global environment, see John Bellamy Foster, “The Ecology of Destruction,” Monthly Review 58, no. 8 (February 2008): 1–14. 7. World Wildlife Fund, Zoological Society of London, and Global Footprint Network, Living Planet Report (2006), http://www.panda.org/downloads/living_planet_report.pdf. 8. John Bellamy Foster, Ecology Against Capitalism (New York: Monthly Review Press, 2002), 94–95. 9. Immanuel Wallerstein, “2008: The Demise of Neoliberal Globalization,” Commentary no. 226 (February 1, 2008), http://www.binghamton.edu/fbc/226en.htm.